After we had this dish at The Lodge the first time we went, I couldn’t wait to recreate the dish at home. I had never cooked mussels before so I was excited to try something new but it also meant I had no idea what I was doing. Thankfully, my trusty Martha Stewart Cooking School book (and possibly the most-used Christmas present I’ve ever received, thanks mom & dad!) had a similar recipe and I was able to incorporate all the components. 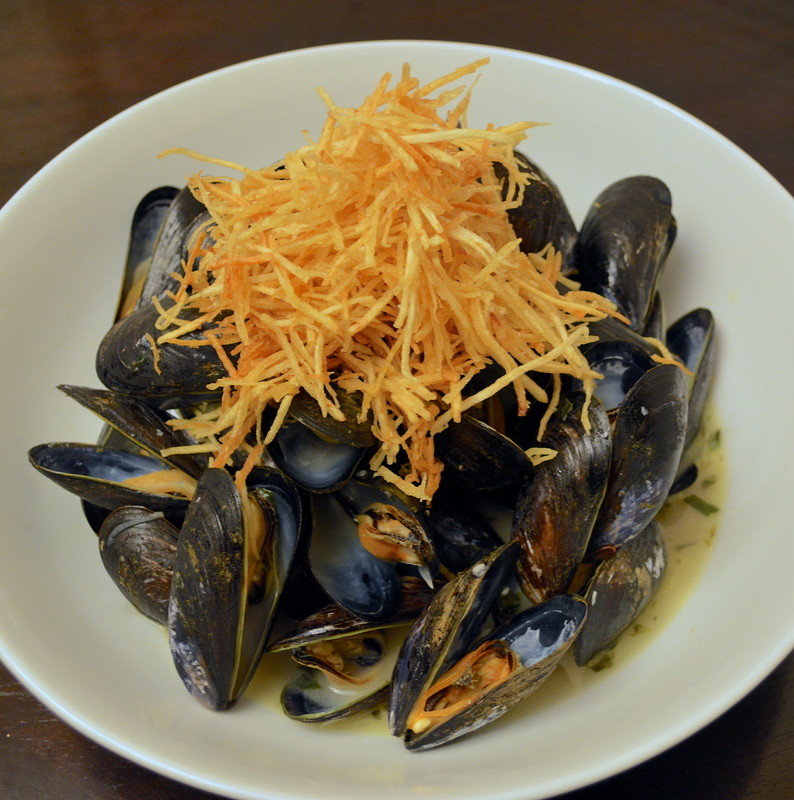 These mussels are steamed in a tarragon butter and white wine sauce and served with a heaping pile of fried shoestring potatoes that are perfect for soaking up the delicious broth! The mussels are the easy part of this recipe, the homemade tarragon butter and the frittes are a little labor intensive (but really worth it if you have the time) so you could swap these out for regular butter and store-bought french fries if you like! If you’ve never tried mussels before this is a great introduction to them! 1. Start by making your tarragon butter. In a small bowl combine 1/2 stick unsalted butter that’s softened, 2 tbsp freshly chopped tarragon, a pinch of salt & pepper and 3 minced cloves of garlic. Mash these all together with a fork and then place on a piece of plastic wrap. Roll into a tube and put in the refrigerator to firm up for at least half an hour. You could make the rosemary butter from this post if you don’t like tarragon or as I mentioned before you can just use regular butter! 2. Next you can make the frittes. In a heavy bottomed pot over medium heat, bring about 4″ of vegetable oil to 350 degrees. Slice two large potatoes that have been peeled on a mandolin on the thinnest setting with the julienne attachment and squeeze all the water out of the shoestrings with a towel (you don’t want any water going into the oil!). Working in small batches, very carefully lower the potatoes into the heated oil using a spider and cook for just a few minutes until golden brown. Remove carefully with a spider and drain on a paper towel. Continue until all the shoestrings are fried then set off to the side. If you want a healthier option you could make my baked version or, as I mentioned before, you could also use store-bought french fries and just cook them in the oven as directed. 3. Now it’s time to prep the mussels, I used 2 lbs fresh mussels. Hold the mussels under cool running water and scrub with a brush to remove any sand or grit. Debeard them by gripping the tough fibers extending from the shell and pull to remove them. 4. Melt 2 tbsp of he tarragon butter you previously made (or a different compound butter or regular butter) in a high side skilled over medium-high heat. Once it’s foamy, add 2 medium shallots that have been thinly sliced, 2 thinly sliced garlic cloves and 1/2 tsp salt. Cook until the shallots are transparent and the garlic is soft, about 3 minutes, stirring to keep the garlic from burning. 5. Stir in 3/4 cups dry white wine (I used sauvignon blanc) and bring to a simmer. 6. Add in the mussels and cover tightly. Cook until all the mussels open, about 6 minutes, stirring halfway through. Throw away any that don’t open and remove the rest from the pot with a slotted spoon into serving bowls. Taste the broth and season with salt & pepper as necessary then whisk in another tbsp of the tarragon butter. Pour the broth over the mussels in the bowls and top with the frittes! Start by making your tarragon butter. In a small bowl combine the butter, tarragon, a pinch of salt & pepper and the garlic. Mash these all together with a fork and then place on a piece of plastic wrap. Roll into a tube and put in the refrigerator to firm up for at least half an hour. Next you can make the frittes. In a heavy bottomed pot over medium heat, bring the oil to 350 degrees. Squeeze all the water out of the potatoes with a towel, you don’t want any water going into the oil! Working in small batches, very carefully lower the potatoes into the heated oil using a spider and cook for just a few minutes until golden brown. Remove carefully with a spider and drain on a paper towel. Continue until all the potatoes are fried then set off to the side. Now it’s time to prep the mussels. Hold the mussels under cool running water and scrub with a brush to remove any sand or grit. Debeard them by gripping the tough fibers extending from the shell and pull to remove them. Melt 2 tbsp of he tarragon butter you previously made in a high side skilled over medium-high heat. Once it’s foamy, add the shallots, garlic and 1/2 tsp salt. Cook until the shallots are transparent and the garlic is soft, about 3 minutes, stirring to keep the garlic from burning. Stir in the wine and bring to a simmer. Add in the mussels and cover tightly. Cook until all the mussels open, about 6 minutes, stirring halfway through. Throw away any that don’t open and remove the rest from the pot with a slotted spoon into serving bowls. Taste the broth and season with salt & pepper as necessary then whisk in another tbsp of the tarragon butter. 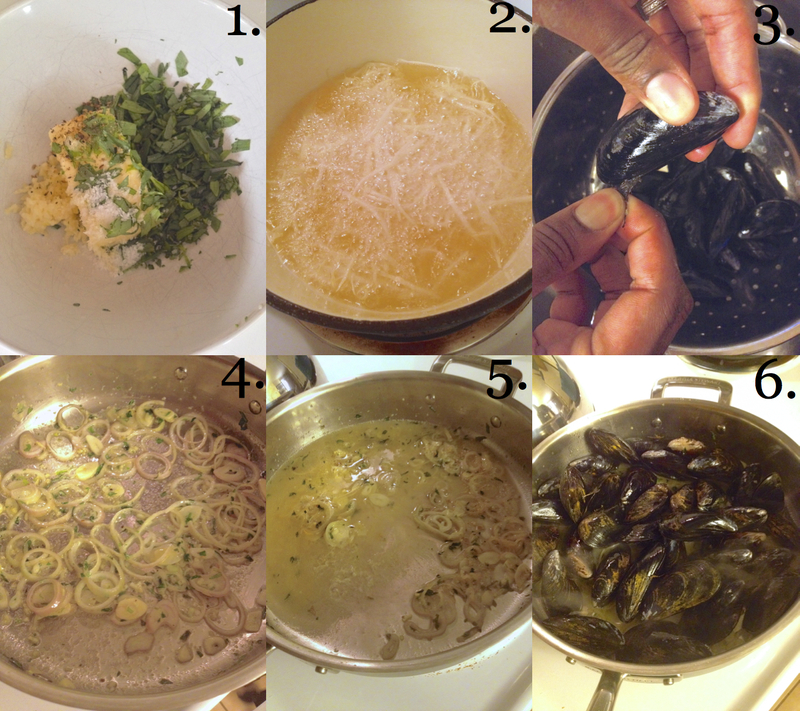 Pour the broth over the mussels in the bowls and top with the frittes! Yes, me too! Nothing better than a warm broth like this! Moules meunière became my obsession! The toughest part of the prep is getting those stupid “beards” off the mussels but boy is it worth it. Happy to see you tackled it too and made a great meal! Right? Getting the beards off is so much tougher than you think it would be, but you’re right it’s so worth it!